NASA recently released an article on the effects of radiation during far journeys in space. This problem does not really arise for astronauts in close orbit around the Earth, due to the protection offered by Earth's strong magnetic field. Cosmic rays can damage an astronaut's telomeres - tiny molecular strands that cap the ends of DNA. 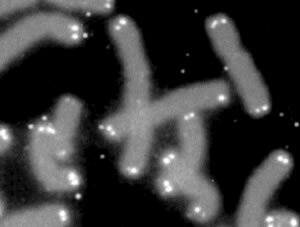 Telomeres shorten each time a cell divides. Eventually, the telomeres are too short, and the cell cannot successfully divide - a state called "replicative senescence." The loss of telomeres is thus associated with aging; they also appear to be a natural defence against out-of-control cell growth, as occurs in cancer. One theory of aging holds that the lack of new, whole cells causes the usual signs of aging; wrinkled skin, weakened immune system and so forth. If, as is planned, manned ships are sent to Mars, this problem will need to be solved. It turns out that science fiction writers have been thinking about this problem. In the The Deadly Years, an episode that aired on 08-Dec-1967, the Enterprise is sent to investigate a problem on the experimental colony Gamma Hydra 4. Mysteriously, virtually all of the colonists have died prematurely - of highly accelerated aging. The only real anomaly that Spock can find is that the planet recently passed through the tail of a unique comet, which showers the planet with low energy radiation. Not surprisingly, Spock and McCoy find an antidote before the end of the episode - adrenalin. "In most [mission] scenarios, you need liquid hydrogen for fuel and you need water. And these are all considered materials that are particularly good for cosmic ray shielding." Using fuel or water as shielding from radiation was originally suggested by science fiction writer John W. Campbell in 1936 (read more about NASA's New Radiation Shielding First Proposed By John W. Campbell). 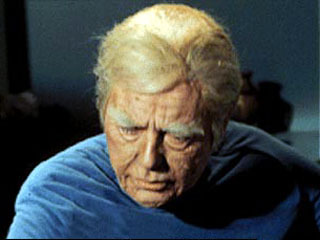 Read what NASA says about radiation and aging; Trek fans will enjoy a blast from the past in Eric's excruciatingly detailed plot summary for The Deadly Years. Thanks to Winchell Chung for the tip and the sf reference.